"Easter Sunday is the greatest of all Sundays, and Easter Time is the most important of all liturgical times. Easter is the celebration of the Lord's resurrection from the dead, culminating in his Ascension to the Father and sending of the Holy Spirit upon the Church. "There are 50 days of Easter from the first Sunday to Pentecost. It is characterized, above all, by the joy of glorified life and the victory over death, expressed most fully in the great resounding cry of the Christian: Alleluia! All faith flows from faith in the resurrection: 'If Christ has not been raised, then empty is our preaching; empty, too, is your faith' (1 Cor 15:14). "The octave of Easter comprises the eight days which stretch from the first to the second Sunday. It is a way of prolonging the joy of the initial day. In a sense, every day of the Octave is like a little Sunday. "The word 'Easter' comes from Old English, meaning simply the 'East.' The sun which rises in the East, bringing light, warmth and hope, is a symbol for the Christian of the rising Christ, who is the true Light of the world. The Paschal Candle is a central symbol of this divine light, which is Christ. 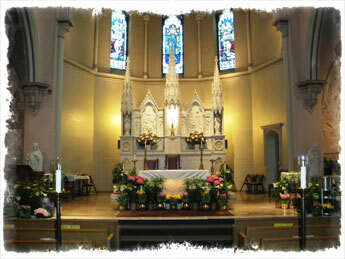 It is kept near the ambo throughout Easter Time, and lit for all liturgical celebrations."